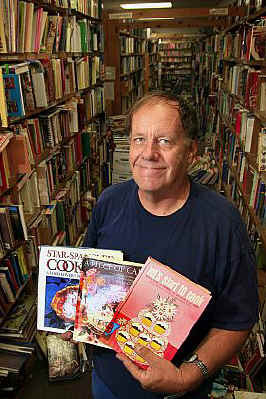 SOMETHING FOR EVERYONE: William Phillips is co-owner of Camelot Books in Fountain Valley. Camelot Books is chock full of literary finds. Name of business:Camelot Books, Inc. Describe your business: We are 4,400 square feet of books and more books. They are 99.99 percent used and rare. We sell all types of reading material. A third of our store is devoted to display or mass-market paperback novels ranging from general fiction and romance to mystery and science fiction. There is a large history section, children's book section, art, cooking, religion, entertainment, music and sports. Where did the idea for your business come from?If you're old enough to remember Andy Hardy movies, and the "let's put on a play off the cuff" attitude, then you know how we started. It was "let's open a bookstore." We both sold books at a swap meet. It was a short step to combining our businesses under a roof. What made you want to get into this business?We were avid readers and enjoyed books. Finding the occasional rare book among the average is a big thrill. It is fascinating, educational and a fun career. Unfortunately, hard work is also included. How are you marketing yourself?Right now, we are strictly word-of-mouth, although our business name is in the local phone books. A sign near the street that says "Books" in big letters also catches people's eyes. We list over 20,000 of our titles on various Internet sites including amazon.com, barnesnoble.com, alibris.com and ablebooks.com. How do you do against so many competitors? How do you make yourself stand out? We try to keep our prices down and try to stock the most interesting and popular books we can acquire. What makes your business unique?I believe that it is our vast selection of titles crammed into most every corner of the store. Many people comment that our store is exactly what they think a used bookstore should be – a little messy with unprocessed boxes of new arrivals calling out to them to take a quick peek to see what treasure might be hiding inside. Additionally, our cashier, Judy, is the most amazing woman. She has an almost encyclopedic knowledge of plots and characters in the thousands of books she has read. What do you want to accomplish with your business?We'd like to continue supplying Orange County and the world with quality reading until we get too old to continue. We're happy with our size and location, and loyal, friendly customers. Where did the name of your business come from? We chose Camelot, which conjures the romance and excitement of King Arthur and his Knights of the Round Table. It gives us a chance to quote from the play and movie, "On this earth there is no finer spot than Camelot." What is your biggest seller?Mass-market romance novels are our biggest sellers. It is impossible to name a single book, but the romance genre is the hardest to keep stocked up. For the last news about used books you should join our African Art Club and become an insider of the African art market.